Kim Hefner-Hines officially began her term as Chair of the NAHB Associate Members Committee at the International Builders Show in February. 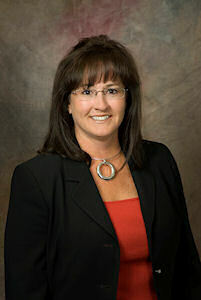 Kim lives in Sioux Falls, and joined the HBA of the Sioux Empire in 1984. She has served on the HBASE Board since 1999, and on the SDHBA Board since 2003. As Chair, Kim will oversee the NAHB Associate’s Committee and it’s subcommittees. The three subcommittees consist of Associate Advocacy, Designations, Training, Leadership, and Recognition, the Associate Outreach Network, and the Associate Strategic Plan Monitor. Associate Members work hand-in-hand with builders every day, and Kim very well knows that “If it affects a Builder, it affects an Associate”. In addition to her duties this year as Associate Chair, Kim also serves on the new Field Reps Program for NAHB Chairman Kevin Kelly, and is Chair of the NAHB Generation X/Generation Y Task Force which is tackling the difficult task of setting up a toolkit and resources to enhance our NAHB programs for the younger generation.